In Iyar 5768 (1998) Rabbi Elyashiv, had to be hospitalized. Despite his hospitalization, he was determined to maintain his daily learning schedule which entailed awakening at 3 A.M. and studying Torah uninterrupted until 7 A.M. However, he was so feeble that he was unable to finish buttoning his shirt; he simply lacked the energy. Still he felt that it was disrespectful to learn with his shirt not fully closed so he asked the grandson that was staying with him for assistance. After his grandson closed his buttons, Rabbi Elyashiv opened his seforim and learned his usual four hour regiment with complete concentration. Rabbi Zilberstein added that it was a living example of the words of the Maharsha, “There is nothing sweeter in all of the engagements of man than the engagement in Torah.” When one achieves that level of love and devotion to Torah study there is nothing in the world that gives that person as much satisfaction and enjoyment as Torah study. Reciting blessings are a very important component of a Jew’s life. The gemara relates that in order to ward off a fatal plague that was ravaging Klal Yisroel, Dovid Hamelech enacted that a Jew should recite a hundred blessings every day. The recitation of blessings constantly arouses within a person a perpetual realization and recognition of the Omnipotence of G-d and His Hand in everything that transpires. · (Devorim 8:10) “You will eat and you will be satisfied, and bless Hashem, your G-d, for the good land that He gave you.” The gemara explains that from this verse we learn the commandment to recite Grace after Meals, whenever one eats a bread-meal and is satiated. · (Devorim 32:3) “When I call out the Name of Hashem, ascribe greatness to G-d.” From this verse, the Gemara exegetically derives that one must recite a blessing prior to studying Torah. The gemara derives a kal v’chomer one must also recite a blessing before one eats. But the blessing prior is only derived from logical reasoning and therefore is only rabbinically obligated. In addition, the gemara discusses the need to recite a blessing after one completes studying Torah. But that too is only a rabbinic obligation. There is a glaring difference between these two exclusively Biblical blessings, i.e. when they are recited. Why are the Biblically-mandated blessings for Torah study recited prior to one beginning to study, while Grace after Meals is recited after one has completed his meal? The Vilna Gaon explains that the difference between the recitations of these two blessings is rooted in human nature. When a person desires something physical it is relatively easy and natural for him to be polite and cordial. If a child wants a snack and the parent replies that the child can only have it if he asks nicely, generally the child will pleasantly and politely restate his request. After one has received what he wanted however, it is common for a person to forget how much he wanted it beforehand, which in turn causes him to forget to express his appreciation for what he received, or at least to express it without adequate feeling. The gemara says that a lion does not roar when it is hungry, but rather when it feels full and satiated. When one is satiated after a fairly large meal, it is common for him to become complacent, and to have a feeling of indolence and lethargy. On the other hand, in regard to spirituality, the opposite is true. The hardest thing is for one to get started. Our Evil Inclination utilizes the force of inertia to restrain us from undertaking good endeavors, such as prayer, Torah study, and mitzvos. But if one is able to overcome his natural sluggishness and indeed prays with concentration, engages in meaningful Torah study, or performs a mitzvah, it will infuse him with a feeling of spiritual bliss and unparalleled fulfillment. In the two Biblically-mandated blessings the subtle profundity and wisdom of the Torah as the Book of Life and human nature becomes apparent. In regard to food – the symbol of physical enjoyment – one is Biblically obligated to recite a blessing after he has eaten and is satisfied, because it is specifically after one is satiated that he often forgets to express his gratitude for what he has received. In regard to spirituality, the converse is true. One must recite the blessings of Torah study prior to beginning his studies, because it is at that point that one may lack a proper feeling of gratitude for the privilege to study Torah. After one has studied he naturally feels a sense of deep gratitude and love for G-d for the ability to comprehend some Torah thoughts. Anyone who has studied Torah and understood some of its depth can relate to that feeling of spiritual fulfillment and achievement. Doron Mahareta grew up and went to school in Ethiopia, and therefore his background in Judaic studies was weak. When he arrived in Israel in his teens he wanted very much to study Torah in the noted Yeshivas Merkaz Harav. But because of his limited familiarity with Talmud study the yeshiva told him he would not be able to keep up with the level of study. He replied that if he could not become a student in the yeshiva he wanted to get a job helping the kitchen, washing dishes and preparing meals. The yeshiva agreed to accept him. For a year and a half Doron worked in the kitchen during all meals. But as soon as he had completed his kitchen duties he would head to the Bais Medrash and study with uncanny devotion. He would often study very late into the night, learning the tractate that the students were studying. One day Doron approached the Rosh Yeshiva and asked him to test him on the tractate of Talmud that the yeshiva was studying. Doron and the Rosh Yeshiva subsequently became engaged in a lively Talmudic discussion. The next day Doron was a full-fledged student and was no longer washing dishes. On weekends when Doron would go home to visit his family in Ashdod, he would spend almost the entire Shabbos engaged in study in the Melitzer Shul or he would study Shulchan Aruch and its commentaries in the Gerrer shteibel. In Shevat 5768, after being in the yeshiva for over ten years, Doron completed his study of the entire Shulchan Aruch! On Rosh Chodesh Adar 5768 (March 6, 2008), Doron was one of eight yeshiva students at Merkaz Harav who was tragically murdered by Arab Terrorists. Doron’s story is analogous to the story of the great Hillel who slept on a roof in the snow so that he could hear and study the Torah learning that was being discussed in the warm Bais Medrash below him. The timeless wisdom of the Torah in dictating which blessings must be recited reminds us that after one has enjoyed physical bounty he must arouse himself to express his appreciation properly, because he naturally loses his impetus to do so. This is true in regard to our relationships with others as well. At the same time, the Torah itself reminds us that we must recite a blessing before commencing its study because at that point it may look daunting, intimidating, and unappealing. But after one has studied and mastered any small amount of Torah the joy he feels is unparalleled and blissful. It is literally worth dying for! Lit. “Please make sweet”; the opening words to the blessings recited each morning prior to studying Torah. The sefer is a compilation of fascinating halachic questions based on the weekly parsha which demonstrate the Torah’s contemporary applicability to every facet of life in a most engaging and intriguing manner. A second volume was published recently. 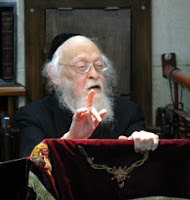 At the time Rabbi Elyashiv was 98 years old. G-d should grant him many more years. If one eats an olive’s-worth of bread but is not completely satiated he has a Rabbinic obligation to recite Grace after Meals. A kal v’chomer is a method of Talmudic derivation. The gemara reasons that if one is Biblically obligated to recite a blessing after he has completed his meal, surely he must recite a blessing before he begins to eat his meal. The only exception is one who eats a large meal in a spiritual fashion on Shabbos. Rashi (Beitzah 16a) explains that the ‘neshama yesayra’ (‘added soul’) one is blessed with on Shabbos allows him to partake in greater doses of physical pleasure and yet not be physically repulsed from doiung so, as one would throughout the rest of the week. The Orchos Tzaddikim explains that if one wants to have a minute taste of what the World to Come – a world without physicality – is like in our world, the temporary blissful feeling one has after performing a good deed or learning Torah with great zeal, is the most analogous to that world, albeit on a far more magnified scale. The Rabbincally mandated blessing prior to eating logically follows, because it is easier to recite a prayer thanking G-d for food before one has enjoyed it and is still tantalized by the food before him.